David Price refuses to give in. The former Olympian and former British and Commonwealth heavyweight champ has been written off more times than he cares to remember, yet he is set to give it one final push next month. According to a news piece in The Liverpool Echo, the 34 year old one-time “sure thing” has parted with trainer Dave Coldwell – the man who attempted to pick up the pieces and salvage Price’s career after his stoppage loss to Erkan Teper – and is now working with George Vaughan, along with former champ Derry Matthews and Joe McNally. Price, 21-4(18) will face a TBA on the September 16 card at The Echo Arena in Liverpool topped by Callum Smith against Erik Skoglund in The WBSS 168 pound tournament. 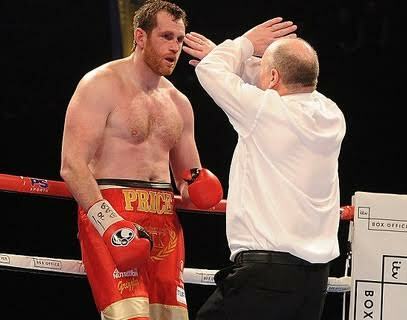 Price, last seen being stopped by Christian Hammer in February, has a history of coming unravelled in fights; with either his chin or his stamina, seriously affected due to his inability to relax in the ring, letting him down. New team or not, it’s tough to see this genuine nice guy of the sport being able to exorcise his demons. Of course, the towering Brit deserves credit for trying again. Written off after his two defeats to Tony Thompson, back in 2013, Price was definitely finished, the experts said, after the quick KO loss to Teper in 2015 (it’s still important to mention how both Thompson and Teper tested positive for illegal stimulants shortly after their respective wins over Price). Then came two confidence building wins under the tutelage of Coldwell, before the final hammer appeared to have been knocked in by Hammer earlier this year. Now, once again, Price is ready to face make or break status in the ring. Price remains a big name and he can of course punch. If matched right, who knows, he could still win himself a biggish fight (remember, he had Hammer down before coming unglued). Still, it seems a herculean task for Price to achieve even half of what was expected of him around five years ago.